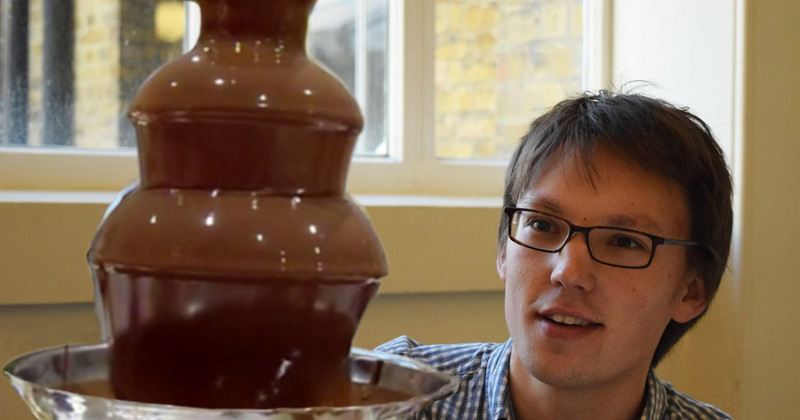 A UCL mathematics student has found that the falling 'curtain' of chocolate in a chocolate fountain surprisingly pulls inwards rather than going straight downwards because of surface tension. "Chocolate fountains are just cool, aren't they!" said Adam Townsend (UCL Mathematics), lead author of the paper based on his MSci project. "But it's also nice that they're models of some very important aspects of fluid dynamics. We've used some serious maths to solve a fun problem- why the chocolate 'curtain' on a chocolate fountain always falls inwards." The study, published today in European Journal of Physics, used classic work on 'water bells' to model the fluid dynamics of the chocolate in the fountain. The physics of the water bell is exactly the same as the falling curtain of chocolate, and by using this model the team discovered that surface tension of the chocolate causes it to fall inwards. "You can build a water bell really easily in your kitchen," said Dr Helen Wilson (UCL Mathematics), co-author of the paper and MSci project. "Just fix a pen vertically under a tap with a 10p coin flat on top and you'll see a beautiful bell-shaped fountain of water." The researchers studied the flow of chocolate up the pipe to the top of the fountain, over the plastic tiers that form the distinctive chocolate fountain shape and down as a curtain. "Both the chocolate fountain and water bell experiments are surprisingly simple to perform. However, they allow us to demonstrate several aspects of fluid dynamics, both 'Newtonian' which includes everyday fluids such as air, water and syrup, and 'non-Newtonian' which is anything with an underlying structure that can be built up or broken down by flow such as biological fluids (e.g. blood) and molten chocolate." said Dr Wilson. "Although this was a fun project about chocolate, gaining an understanding of the thin film flows in the chocolate fountain might help with applications as diverse as lava flow on volcanoes, tear films in the eye, and extracting plasmas out of nuclear fusion reactors," concluded Dr Wilson. The researchers are also pleased that their work allows them to engage with the public. Adam Townsend added, "I've been talking at mathematics enrichment events around London for the last few years. If I can convince just one person that maths is more than Pythagoras' Theorem, I'll have succeeded. Of course, the same mathematics has a wide use in many other important industries - but none of them are quite as tasty as chocolate."